Search Pittsburgh, Philadelphia, and all points across the state, and you would be hard-pressed to find a Pennsylvanian without an instinctive, childhood connection to the classic American hot dog. From ballparks to street carts, the nostalgia of a steaming sausage is hard to beat. Fortunately for our adult iterations, a quality dog is easy to find, no matter which corner of the Keystone you call home base. While a trip to Destination Dogs will set you back a bit more than the hot dogs of your youth, the experience is worth every penny. This travel themed craft beer and hot dog haven serves up internationally themed sausages (try the Charles Dog Gaulle—duck sausage with duck confit and shaved foie gras) alongside cold beer and trendy vibes. All sausages (beef, duck, lamb, chicken, alligator, python, and kangaroo among them) and buns are made on premises, and are served until 2 a.m.
Part bar, part restaurant, part “beer cave,” D’s Six Pax and Dogz is a seriously cool spot in Steel City. Choose from over 1,000 kinds of bottled beer to enjoy on site, or build your own six pack to take home (a very grown up take on the classic goodie bag). Add daily specials, quality hot dogs, impressive wall art, shockingly good pizza, and nearly addictive coleslaw, and D’s Six Pax and Dogz easily earns a spot on our list. As one of the top hot dog consuming cities in America, it’s no surprise that Scranton’s Coney Island consistently finds itself ranked among the best sausage sanctuaries in the country. An unassuming, retro location paired with classic hot dogs, smiling service, and insanely good pie, Coney Island is a can’t miss meal, whether you live locally or make it a dining destination. Johnny’s Hots may not look like anything special, but one bite will make you a true believer. Try the “Hot Combo,” a perennial favorite mix of smoked sausage, smashed fish cake, fried onions and mustard. Super-fast service makes Johnny’s Hots ideal for workday lunches or whirlwind weekends. This underground hot dog joint serves up a taste of the windy city in our very own commonwealth. Authentic Chicago style dogs, legendary fries, and friendly service easily boost Yovi’s onto my list of favorites. For 70 years, Pennsylvanians have flocked to Meadville for an Eddie’s foot-long with their famous secret sauce. Selling mostly hot dogs, sloppy joes, and fries, Eddie’s has two locations (one seasonal, one year-round), and legions of devoted fans. The best possible kind of dive, Lucky Louie’s has become an Erie staple, and rightfully so. 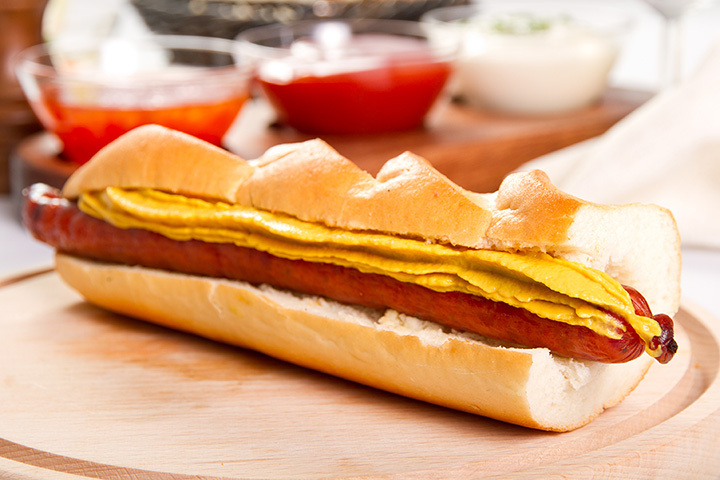 Great hot dogs, many with available vegetarian alternatives, and ice cold beer (over 300 varieties) are a winning combination, whether you eat in or take out. During warmer months, bring your canine companion and enjoy a relaxed meal on a lovely patio, or take home a discounted six pack of your own creation any time of year. Visiting Paulie’s in Honesdale is like going to a carnival, without the hassles of long lines or having to spend time outside. Everything on the menu can be cooked in under six minutes in their open kitchen, and with what they’re serving you’ll devour it in even less time. Quick eats means more time for the on-site arcade, featuring games, pool, and air hockey. Jimmy’s made its Easton debut in 1908 as a push cart vendor, and now holds a more permanent space in the community’s heart. Selling only hot dogs, soda, and milk (chocolate and plain), this down and dirty space makes up for in flavor what it lacks in frills. Yocco’s has been a beloved institution of the Lehigh Valley since 1922, and seems to get even better with age. Hot dogs are served well done (just go with it) and are best with a generous slathering of their top secret chili. Be sure to try the decadent pierogies or beer battered onion rings.